Stay where the magic never ends and every dream is just a wish away. There is a Walt Disney World® Resort for every taste and budget - where you're always surrounded by Disney signature quality, service and special benefits. Extra Magic Hours - Each day one of the Disney Theme Parks opens an hour early or stays open up to an extra three hours in the evening, so Guests of a Disney Resort get extra time in the parks. Disney's Magical Express Service - Your vacation starts the moment you arrive at the Orlando International Airport. Disney takes you from the Orlando airport to check-in, while your luggage goes straight from the plane to your room. Enjoy comfortable transportation to and from the airport in themed air conditioned motorcoaches. When your vacation's over, you and your luggage are whisked back from your Disney Resort to the airport. Disney Transportation - Save time and money thanks to complimentary transportation throughout the Walt Disney World® Resort, including motor coaches, water taxis and Monorail System. Magic Your Way Tickets give you ultimate flexibility. 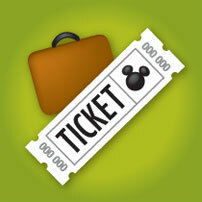 Customize your vacation with Theme Park Tickets that allow you to make every dream come true. Want to go to just one Theme Park per day? You can do it. Want to go back and forth from Park to Park on the same day? No problem. Want to experience other attractions like the Water Parks, Downtown Disney® Pleasure Island, DisneyQuest® Indoor Interactive Theme Park, or Disney's Wide World of Sports® Complex? You can do it all. How about a ticket the never expires? It's your choice. With Magic Your Way Vacations, you can select how many days you want tickets for, keeping in mind that the per-day price decreases the longer you play. *Theme Park admission is valid for 14 days from first use, unless the NO Expiration Option is also purchased. With the Park Hopper® Option, no matter where you begin your day, you can go from park to park to enjoy the evening Extra Magic Hours. With so much fun to be had, you won't want to miss out on any of it! **This option provides a certain number of Plus visits based ont the length of the ticket purchased. For each Plus visit, you can choose to visit one of the attractions listed. ^Except for activities/events that are separately priced. Purchase Tickets in advance and you can head right over to the turnstiilles without having to wait in line. No Expiration Option can be added to Premium Ticket. Ticket prices do not include tax. All tickets expire 14 days after first use unless the No Expiration Option is purchased. Some events are separately priced. *These prices reflect Pre-Arrival Savings which are available if this ticket option is purchased prior to arrival at the Walt Disney World® Resort. Magic Your Way Base Ticket of 5-Days or more are eligible for Pre-Arrival Savings when either the Park Hopper® Option and/or Magic Plus Pack Option is added. Prices will calculate automatically. Multiple options can be selected, and revised at any time to obtain a new price. Click here to access the Ticket Calculator. *Interline rates apply to all active airline employees only - two rooms maximum per employee. Subject to availability and some restrictions apply. Proof of airline employment is required upon booking. Additional taxes/fees may apply. See Walt Disney World brochure for complete details, terms and conditions.